My word for 2017 and Joyful January!!! Happy New Year!! I hope you had a blast? I realise that the title of this post might be a bit of an oxymoron. January is often a tough month for many, after the excitement of Christmas and reality kicking back in. So I’ve been thinking about what we could do, as the NHM Community, to spread a little more joy during January. I put out a request a few days ago asking for some volunteers and I now have some lovely “NHM Joy Fairies” who are going to help me put out affirmation cards for Mum’s in strategic places across North Hampshire. The whole idea came from Lindsey who mentioned a while back that she was doing something similar at work to help boost morale. I then had a moment of inspiration and thought that it would be awesome to try to do the same thing for local Mum’s. So I’ve put together lots of little cards which have positive affirmations on them just for Mum’s and the “NHM Joy Fairies” and myself will be leaving them all over North Hampshire, for you to find and keep. If you do find one, please let me know via NorthHantsMum@gmail.com. It would be awesome if there were pictures of the cards and where they were found too. I am hoping that these little cards make at least one Mum feel a bit better if she’s having a tough month. If you would like to be a “NHM Joy Fairy”, please get in touch too. 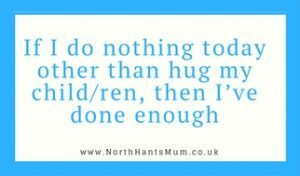 As I’ve mentioned before on NorthHantsMum, I don’t make New years resolutions anymore because they don’t really work for me. Instead I choose a word for the year, that I use as a theme for the year. This year my word is “Joy”. Which is why “Joyful January” is so cool as it ties in with my word of the year! I’m hoping to spread and receive lots more joy during 2017. If you have any ideas on this, please let me know!! !